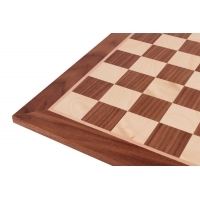 Discover our wide range of wooden veneer chessboards. Our offer comprises various kinds of boards according to size, wood type and production country. You can choose between alphanumeric notation in capital or small letters or have a board without notation at all. There are boards with rounded or squared corners and rims at your disposal. All boards have been crafted by the best artisans and carefully checked before left for sale. We have the chessboards from India, China and Poland. The materials used include such unusual wood types as padauk, redwood and sycamore or more common such as walnut, birch, beech and hornbeam.